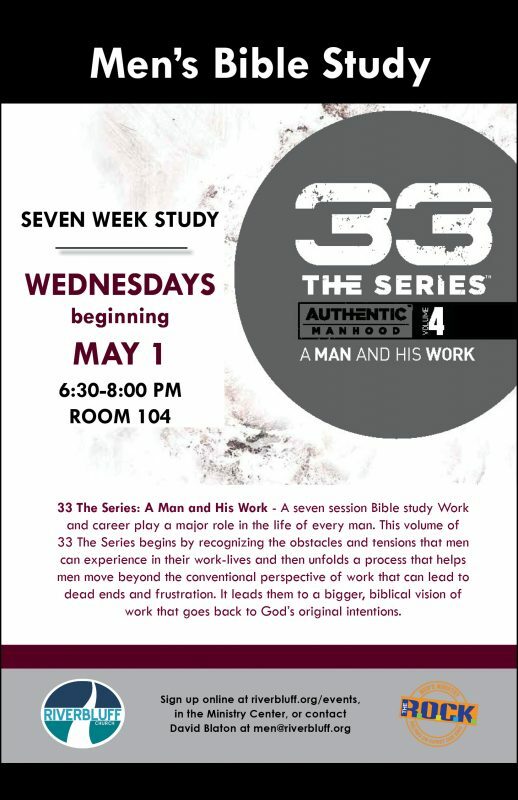 Join the Men’s Ministry for the next study in the 33 THE SERIES: A MAN AND HIS WORK . We will be meeting on Wednesday evenings, beginning May 1 for seven weeks from 6:30-8:00 pm. Work and career play a major role in the life of every man. This volume of 33 The Series begins by recognizing the obstacles and tensions that men can experience in their work-lives and then unfolds a process that helps men move beyond the conventional perspective of work that can lead to dead ends and frustration. It leads them to a bigger, biblical vision of work that goes back to God’s original intentions. A Biblical Blueprint of work is introduced to serve as a guide that men can apply to their work journey as they seek to come alive and live out God’s will in their work. Some biblical and modern examples will helpmen begin to understand how they can apply the Blueprint to their lives. Also included are: key essentials that help men live out the Blueprint; dangerous work traps that can derail a work journey; and important catalyzers to help maximize their work experiences. Work is too important for us to settle. It is a huge part of who God made us to be. It is essential to understand and master God’s vision of work for us in order to live out work-lives full of passion and purpose.